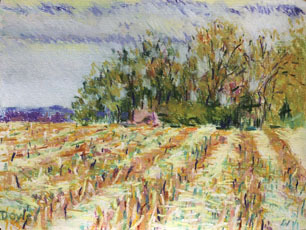 This is a reproduction of an original pastel, Lancaster Field. Lancaster County, Pennsylvania is known for its farm scenes; this is a cornfield in the fall, when the corn has been cut down and the dried stubs of the stalks remain. The rows are seen in perspective from right to left in the image. With pastel, you can build up an image with many layers and marks of color, producing new areas of mixed color, as the Impressionists did. Color applied in this manner is called 'broken' color, meaning that the color areas are not applied in flat areas, nor as shaded volumes, but as individual separate marks or dabs. These marks and strokes can also become compositional devices for directional movement in an image.